We have just published our latest book, Red Skies: Bible Prophecy and World Events. It is a new kind of book—the outgrowth of our yearly summary of recent prophetic developments. It combines basic teaching about Bible prophecy with some of the most significant current headlines. Red Skies explains how biblical predictions make sense of the current overwhelming problems that threaten our tumultuous world. Jesus noticed that the religious leaders of His day could forecast the weather when they saw red skies, but they were not aware of the major prophecies that were being fulfilled by His life and ministry. He taught His disciples what will happen on earth just before He comes again. 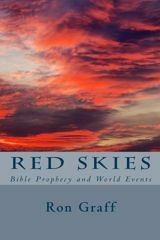 Red Skies: Bible Prophecy and World Events ($11.99, paperback, 978-1505376074) gives a chronological list of things to come–based on Jesus’ own four-part outline of the future. It includes major developments of our generation, giving insight to such issues as the growing struggle between Islam and the Western world, animosity toward Israel, and the persecution of Christians. Each aspect is illustrated by summaries of recent world events. It explores prophecies about End Times events, including the declining influence of the Church, financial malaise, weak governments and the lack of respect for them, the accelerating threat of major wars, natural disasters, terrifying diseases like Ebola, and much more. Red Skies examines the need for a new revival of Christian belief and zeal, and it lists some of the signs that this new great awakening could occur. The book explains the “Rapture,” which will transport true believers in Christ into His presence. It then describes the major aspects of the seven-year Tribulation, when a powerful and charismatic leader will appear. Unfortunately, once he has gained power, he will establish the final evil empire, supported by a coalition of world religions. He will impose an economic dictatorship and, using advanced technology, require everyone to receive the “mark of the beast” in order to buy or sell anything. Finally, at the Campaign of Armageddon, Christ will return to earth to establish His righteous kingdom. We are hopeful that many of our friends will buy the book (paperback or Kindle), and then record their reviews on Amazon to encourage other people to read it. Visit the product page for Red Skies. This entry was posted in Antichrist, Beast, Bible, Commentary, Eschatology, Evangelism, Fearful Events, Heaven, Islam, Israel, Mark of the Beast, Plagues, Prayer, Rapture, Red Skies, Religions, Revelation, Revival, Technology, Terrorism and tagged Bible prophecy, Catholic Church, Jesus, Prophecy Central, Rapture, Red Skies, Revival, Ron Graff, World Events. Bookmark the permalink.